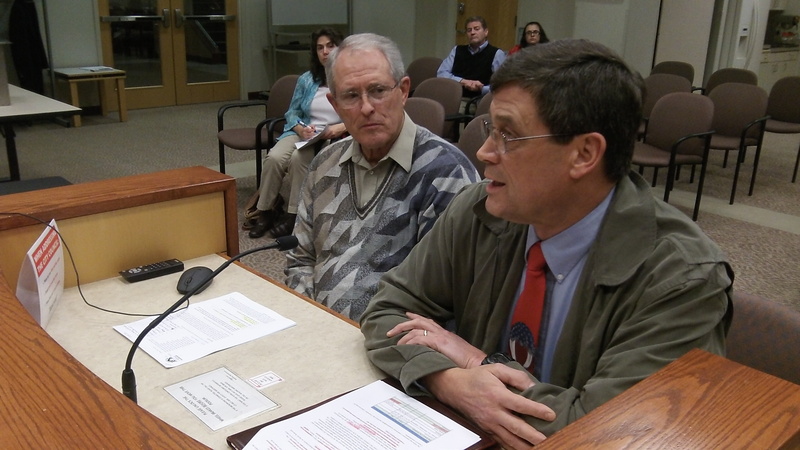 Frank Morse, left, and Dave Burright ask the council to accept their committee’s report Wednesday. Next time, the Albany City Council can probably count on at least three more votes than it got the last time for a bond issue for a new police headquarters and downtown fire station. But it is hoping for a lot more than that. Retired Linn County Sheriff Dave Burright says he, his wife and mother voted against the $20.3 million package when it was rejected in 2013. Next May, voters will likely get a proposal for no more than $18 million, and Burright says he’ll support it and he’s pretty sure his wife and mother will too. Burright and retired state Sen. Frank Morse, R-Albany, Wednesday asked the city council to accept the recommendations of a special review committee they co-chaired on the police and fire plans. The council thanked them and all the panel’s members for their long and tedious work — 15 meetings over several months, totaling some 450 person hours in the reckoning of Councilor Floyd Collins — and voted unanimously to accept the report. The council also got an update on what the design consultant chosen for the combined project, Mackenzie of Portland, will charge: $112,850 for a preliminary architectural and design services for the police station, and $105,550 for the same work on the fire station. That work is supposed to be finished by February, when the council plans to put the smaller bond proposal on the ballot for a May 2015 election. If the voters approve the bond, Mackenzie then would finish the designs for both buildings and provide services during construction. In total the firm would charge $1,061,150 for working on the police project and $721,730 for the fire station, including the preliminary designs. Lemme get the picture right as put in this mornings D-H. Out of one side of the councils mouth they have no problem in keeping our water bills the highest around. Then on the other side of it’s collective mouth they tell us of the consulting costs for the two proposed Taj Mahals. Couldn’t they have separated the announcements by a week or so to allow most of the average voters to forget & not immediately put two and two together?! I guess Hasso did not find the discussion about reducing the costs to actually operate the buildings as important. The building design must reflect the desire to reduce operating costs incurred by headcount. What staffing increases will be seen because the plan shows rooms (that) can be called.jail cells, detention rooms, or holding cells. I don’t want another Public Safety Levy on the ballot in 2016 because we don’t have enough money to operate the police building. The last County public safety levy to open the closed jail wing still has not re-opened. The last Albany Public Safety levy passed by a very slim margin and there was no organized opposition. That may change if the buildings don’t provide headcount constraints. Please recall the City spends $24.5M annually for fire&police; which is mainly headcount.